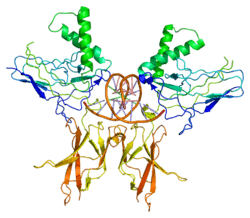 Nuclear factor NF-kappa-B p100 subunit is a protein that in humans is encoded by the NFKB2 gene. Mutation of the NFKB2 gene has been linked to Common variable immunodeficiency (CVID) as the cause of the disease. Other genes might also be responsible. The frequency of NFKB2 mutation in CVID population is yet to be established. The protein NFKB2 can become mutated and lead to hereditary endocrine and immuneodeficiences. The mutation occurs at the C-terminus of NFKB2 and it causes common variable immunodeficienciency which in turn causes endocrine deficiency and immunodeficiencies. A NFKB2 mutation can cause things like adrenocorticotropic hormone deficiency and DAVID syndrome which is a pituitary hormone deficiency and CVID. The mutations that occur within the C-terminus affect the serine 866 and 870. These serines are considered phosphorylation sites for NFKB2. These mutations at the serine’s in the C-terminus lead to CVID in combination with other endocrine deficiencies. These endocrine deficiencies along with the mutation of NFKB2, lead scientists to believe that mutation of NFKB2 is a rare hereditary disease called DAVID’s disease. ↑ Schmid RM, Perkins ND, Duckett CS, Andrews PC, Nabel GJ (Aug 1991). "Cloning of an NF-kappa B subunit which stimulates HIV transcription in synergy with p65". Nature. 352 (6337): 733–6. doi:10.1038/352733a0. PMID 1876189. ↑ "Entrez Gene: NFKB2 nuclear factor of kappa light polypeptide gene enhancer in B-cells 2 (p49/p100)". ↑ Chen K, Coonrod EM, Kumánovics A, Franks ZF, Durtschi JD, Margraf RL, Wu W, Heikal NM, Augustine NH, Ridge PG, Hill HR, Jorde LB, Weyrich AS, Zimmerman GA, Gundlapalli AV, Bohnsack JF, Voelkerding KV (Nov 2013). "Germline mutations in NFKB2 implicate the noncanonical NF-κB pathway in the pathogenesis of common variable immunodeficiency". American Journal of Human Genetics. 93 (5): 812–24. doi:10.1016/j.ajhg.2013.09.009. PMID 24140114. 1 2 3 4 Brue T, Quentien MH, Khetchoumian K, Bensa M, Capo-Chichi JM, Delemer B, Balsalobre A, Nassif C, Papadimitriou DT, Pagnier A, Hasselmann C, Patry L, Schwartzentruber J, Souchon PF, Takayasu S, Enjalbert A, Van Vliet G, Majewski J, Drouin J, Samuels ME (December 2014). "Mutations in NFKB2 and potential genetic heterogeneity in patients with DAVID syndrome, having variable endocrine and immune deficiencies". BMC Medical Genetics. 15: 139. doi:10.1186/s12881-014-0139-9. PMC 4411703 . PMID 25524009. 1 2 3 Shi C, Wang F, Tong A, Zhang XQ, Song HM, Liu ZY, Lyu W, Liu YH, Xia WB (October 2016). "NFKB2 mutation in common variable immunodeficiency and isolated adrenocorticotropic hormone deficiency: A case report and review of literature". Medicine. 95 (40): e5081. doi:10.1097/md.0000000000005081. PMID 27749582. 1 2 Thornburg NJ, Pathmanathan R, Raab-Traub N (Dec 2003). "Activation of nuclear factor-kappaB p50 homodimer/Bcl-3 complexes in nasopharyngeal carcinoma". Cancer Research. 63 (23): 8293–301. PMID 14678988. ↑ Bours V, Franzoso G, Azarenko V, Park S, Kanno T, Brown K, Siebenlist U (Mar 1993). "The oncoprotein Bcl-3 directly transactivates through kappa B motifs via association with DNA-binding p50B homodimers". Cell. 72 (5): 729–39. doi:10.1016/0092-8674(93)90401-b. PMID 8453667. ↑ Fong A, Sun SC (Jun 2002). "Genetic evidence for the essential role of beta-transducin repeat-containing protein in the inducible processing of NF-kappa B2/p100". The Journal of Biological Chemistry. 277 (25): 22111–4. doi:10.1074/jbc.C200151200. PMID 11994270. ↑ Vatsyayan J, Qing G, Xiao G, Hu J (Sep 2008). "SUMO1 modification of NF-kappaB2/p100 is essential for stimuli-induced p100 phosphorylation and processing". EMBO Reports. 9 (9): 885–90. doi:10.1038/embor.2008.122. PMC 2529344 . PMID 18617892. 1 2 3 4 5 Bouwmeester T, Bauch A, Ruffner H, Angrand PO, Bergamini G, Croughton K, Cruciat C, Eberhard D, Gagneur J, Ghidelli S, Hopf C, Huhse B, Mangano R, Michon AM, Schirle M, Schlegl J, Schwab M, Stein MA, Bauer A, Casari G, Drewes G, Gavin AC, Jackson DB, Joberty G, Neubauer G, Rick J, Kuster B, Superti-Furga G (Feb 2004). "A physical and functional map of the human TNF-alpha/NF-kappa B signal transduction pathway". Nature Cell Biology. 6 (2): 97–105. doi:10.1038/ncb1086. PMID 14743216. ↑ Li Z, Nabel GJ (Oct 1997). "A new member of the I kappaB protein family, I kappaB epsilon, inhibits RelA (p65)-mediated NF-kappaB transcription". Molecular and Cellular Biology. 17 (10): 6184–90. doi:10.1128/mcb.17.10.6184. PMC 232469 . PMID 9315679. 1 2 Scheinman RI, Beg AA, Baldwin AS (Oct 1993). "NF-kappa B p100 (Lyt-10) is a component of H2TF1 and can function as an I kappa B-like molecule". Molecular and Cellular Biology. 13 (10): 6089–101. doi:10.1128/mcb.13.10.6089. PMC 364669 . PMID 8413211. ↑ Ayroldi E, Migliorati G, Bruscoli S, Marchetti C, Zollo O, Cannarile L, D'Adamio F, Riccardi C (Aug 2001). "Modulation of T-cell activation by the glucocorticoid-induced leucine zipper factor via inhibition of nuclear factor kappaB". Blood. 98 (3): 743–53. doi:10.1182/blood.v98.3.743. PMID 11468175. Schreck R, Albermann K, Baeuerle PA (1993). "Nuclear factor kappa B: an oxidative stress-responsive transcription factor of eukaryotic cells (a review)". Free Radical Research Communications. 17 (4): 221–37. doi:10.3109/10715769209079515. PMID 1473734. Baldwin AS (1996). "The NF-kappa B and I kappa B proteins: new discoveries and insights". Annual Review of Immunology. 14 (1): 649–83. doi:10.1146/annurev.immunol.14.1.649. PMID 8717528. Chen F, Castranova V, Shi X, Demers LM (Jan 1999). "New insights into the role of nuclear factor-kappaB, a ubiquitous transcription factor in the initiation of diseases". Clinical Chemistry. 45 (1): 7–17. PMID 9895331. Bottex-Gauthier C, Pollet S, Favier A, Vidal DR (Apr 2002). "[The Rel/NF-kappa-B transcription factors: complex role in cell regulation]". Pathologie-Biologie. 50 (3): 204–11. doi:10.1016/s0369-8114(02)00289-4. PMID 11980335. Garg A, Aggarwal BB (Jun 2002). "Nuclear transcription factor-kappaB as a target for cancer drug development". Leukemia. 16 (6): 1053–68. doi:10.1038/sj.leu.2402482. PMID 12040437.